“We hold these truths to be self-evident, that all men are created equal, that they are endowed by their Creator with certain unalienable rights, that among these are Life, Liberty and the pursuit of Happiness.” Of course, we all know that these famous words are from our country’s Declaration of Independence; it is what we celebrate on July 4th—freedom from tyranny, freedom from oppression, freedom from governance without representation. Freedom! It seems to be the most important characteristic of our nation and our people. We have freedom and it was won at a very high price. The Bible speaks of freedom in terms of how Jesus frees us from slavery to sin and eternal death. This freedom was also won at a terribly high price, Jesus’ death on the cross. It seems that, since freedom comes at such a high price, it should be used for purposes that are worthy of the cost of freedom. So the question today is: What is our freedom for? Happy Independence Day! Every year at this time we celebrate the adoption of the Declaration of Independence in 1776. It is a day to celebrate that we are a free nation, not subject to another country’s rule. This freedom came at the cost of a NINE YEAR WAR and an unknown number of lives lost. We are reminded of these words from our Declaration of Independence: “We hold these truths to be self-evident, that all men are created equal, that they are endowed by their Creator with certain unalienable rights, that among these are Life, Liberty and the pursuit of Happiness.” There is, of course, much more to this document that seeks to explain in detail why the original thirteen colonies wished to separate from Great Britain. Knowing all the details of this conflict and the events leading up to it helps us reconcile the high price paid for the freedoms we now enjoy. My guess is that most people are only familiar with the one sentence I just read. As we get further and further away from the events that led us to becoming the United States of America, it is normal that each generation would be less and less familiar with all the details…Maybe knowing “the gist” is enough. These days Independence Day is a day to be free from work by taking the day off. It is a day to be free from our diet as we enjoy too much food and drink at the family barbeque. It is also a day to be free from common sense as we set fire to huge sums of money in pursuit of the biggest explosion, the brightest sparkles in the sky, and the loudest reaction from the neighborhood dogs. Notice that each of these, admittedly sarcastic, examples is a “freedom from” statement. My hope today is that we might imagine together what it might mean for us to think in terms of what our freedom is FOR. Let us pray…Guide us today, Lord, as we approach your Word. Remind us that we are free because we are your creation and we are free from sin because of the price paid by Jesus on the cross. Bless our meditation on this Scripture today. Amen. In the early days of the Jesus movement, there was often disagreement over what Jesus said, what Jesus meant to say, and how his followers were supposed to live in a culture so different from the kingdom Jesus talked about. Come to think of it, these same disagreements exist today in churches all over the world. One of the chief disagreements was between faithful Jews who also followed Jesus and the Gentile believers who knew nothing of ancient Jewish laws and customs. The problem centered on claims that one comes to Christ, not just by virtue of the cross, but only by also obeying the Laws of Moses; thus the emphasis on circumcision as a requirement for salvation. It is to this particular disagreement that Paul speaks in his Letter to the Galatians. Think: worship styles; attitudes in prayer; slain in the Spirit; etc. “To be a Christian you must vote Republican”…or Democrat…or whatever, you get the idea. God only loves heterosexual people; or white people; or American people; or Christian people. I have been told that you can’t get to heaven if you are a Roman Catholic. I was once advised that baptism is only valid if you are fully immersed and old enough to understand it. I’ve heard a lot of things about how to get to heaven, how to get saved, and how to gain God’s love. The thing is, most of this stuff doesn’t seem to be supported by the Bible and the teachings of Jesus. Paul’s letter takes up the issue of circumcision because that is what is relevant to those people. But the real point of the story is that nobody – no church and no individual – should manufacture tests for salvation that don’t come from God. Jesus said we will be judged by how we loved; the rest is insignificant to our new creation in Jesus. Let’s look at a recent, and less controversial, example. We have all been trained in our denominational traditions and our religious habits. Our worship preferences are ingrained in us. Each one of us has particular ideas about who we are as a child of God and what the rest of God’s children ought to be like. We can all probably tell someone what it takes to achieve eternal salvation. We are a free people – free to worship; free to live as we wish; and free to think what we want. (If we are honest, each of us is more free than the next guy to do whatever we want.) But, just because we CAN do something doesn’t mean that we SHOULD. We are free to ignore the problem of homelessness and let somebody else deal with it. We are free to pretend that we are not obligated to care for God’s good Creation and leave it better than we found it for our descendants. We are free to walk on the other side of the street to avoid something unpleasant up ahead. We are free to condemn those who disagree with us, making no effort to listen to their point of view. We are free to think that God doesn’t want certain kinds of people in Eternity. We are free to believe that God has favorites among modern political parties, nations, or football teams. We are free indeed, but our freedom comes with a call to obedience. If we use our freedom to obstruct another from seeing the face of Christ; if we use our freedom to belittle or diminish the value of another human being; if we use our freedom for selfish endeavors that harm any part of Creation; then we are at risk of being free to destroy ourselves. 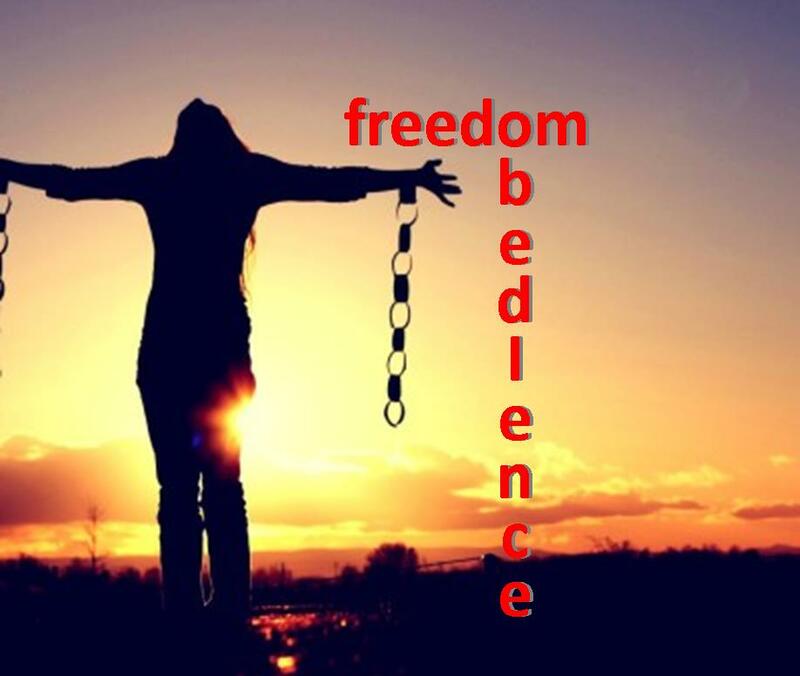 Freedom demands obedience to the One who makes us free – Jesus Christ. We are free FOR something – to share the love of God. In the Name of the Father and of the Son and of the Holy Spirit. Amen.